Survey 7 on The Economy, Environment and Public Policy was conducted between November 30 and December 10, 2010 with 400 Oregonians age 18 and older. This survey departed from the prior five statistical sample surveys where we drilled deeper into cultural values as they relate to our research into consumption attitudes. Rather, this survey covers some cultural issues much more generally and broadly, especially cultural views toward the economy and broad views of our political system. Unlike our earlier surveys we used no “values theory” question battery, opting instead to free up room for more open-ended responses to certain general questions such as the direction of the country. Another format change from the prior five was a return to a “forced choice” style of question where a respondent is asked to choose between to potentially difficult pathways defining our cultural direction. The question form uses a pair of statements designed to frame oppositional differences which are cultural dilemmas. A refinement on the commonly used forced choice is that we define what we mean when we ask a respondent if they “feel strongly” as being sufficient for “taking some action such as speaking out in public, writing a letter to a newspaper, donating money to an organization or being a key reason for voting for an issue or person.” We believe this question form improves the measurement of extremity of viewpoint as a “behavior” indicator than commonly available through standard measures of “level of agreement” where acquiescence (tendency to be agreeable) bias is a well researched weakness in surveying. Consistent with past methodology, the survey questionnaire was peer reviewed and pre tested before fielding to minimize bias or priming. 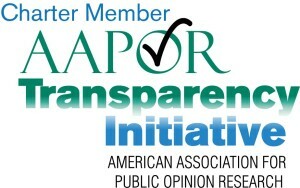 The last question of the survey asked respondents if they had any observations or comments about the survey, about half respondents offered input but only four of four hundred offered that the survey seemed prejudiced or biased; two were self-identified conservatives and two were liberal-progressives. PI’s telephone landline sample method recognizes a bias toward older and more conservative respondents. We do not yet consider this a fatal weakness because we prefer a slight slant to conservative views on the environment and public policy, two topics toward which conservatives are commonly seen as unsympathetic. Nonetheless, a follow-up survey of 1200 northwest respondents of our key benchmark items in January of 2011 by DHM Research affirmed the accuracy of our findings, a topic discussed in the Survey 7 briefing paper about citizen dissatisfaction with contemporary pubic policy. Other than being slightly conservative and older age biased, the survey is geographically and gender representative of Oregon citizens eighteen and older.